After years of calls for Anti-Capitalist Marches on May Day, Seattle was ready for something different. While early actions in 2012 and 2013 proved to be invigorating opportunities to break out of Capitalism’s daily grind and imagine a new world, more recent years have not been so successful. Having a police force so well trained to handle black blocs and rowdy marches (at least when they have time to prepare for them) that other cities’ cops fly in to learn from them hasn’t helped. Beyond this single point of opposition, though, there has emerged over the last few years a desire to try something new, to innovate tactically and in terms of our imaginations. In this spirit, a call went out for a Decentralized May Day, centered around these points of unity. Rather than coming together for a single march, organizations, crews, and individuals took their own actions around the city, all grounded in a spirit of “anti-capitalism and anti-oppression.” Similar calls were made by groups in Olympia, Durham, Philadelphia, and other cities. Reflecting on May Day, we can say that the call was largely a success. In contrast to many past years, where significant jail support was required, only one individual was arrested for throwing rocks at Amazon’s “Bezos Balls.” Meanwhile, a number of different groups were able to take meaningful direct action, and many ended the day feeling significantly more empowered than in years past. There were some critiques, the most common being a desire to find some way to achieve a physical space to come together and help those new to the scene get plugged in. Most, though, seemed to feel that 2018 could well serve as a blueprint for the future. Hopefully the success of this first attempt can be built upon and expanded in the future, while finding ways to balance total decentralization while preventing it from becoming isolation. Below is a roundup of actions that took place and have been publicly mentioned. There were likely many acts of monkey-wrenching that have gone unpublicized, but this solid array provides a lot to feed the imagination. 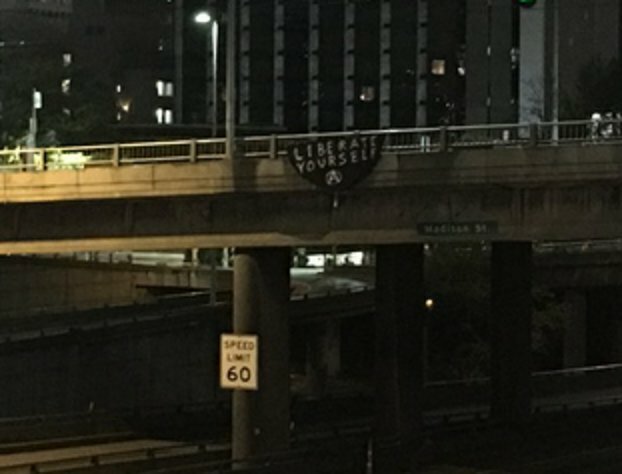 Many Seattleites awoke to find banners dropped over major interstates like I-5 and I-90, and badass tags around the city. These classic actions helped set the tone for the day. 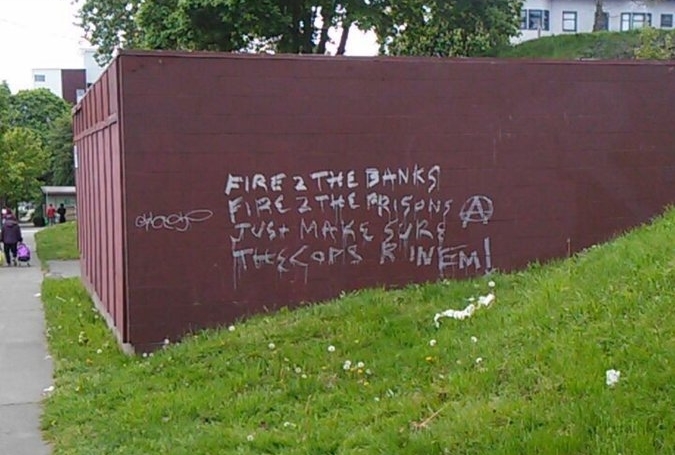 A couple reportbacks have appeared on Puget Sound Anarchists which give some neat ideas for how small crews and affinity groups could take action in the spirit of the holiday. One group (link https://pugetsoundanarchists.org/queer-ghosts-haunt-seattle-may-day-a-reportback-regarding-someautonomous-anarchist-actions/ ) hit the streets of Capital Hill, Seattle’s heavily gentrified historic queer neighborhood, to do some “bashing back.” Other reports include groups “liberating” the city’s bike shares as well as other acts of monkey wrenching and tagging. A motley collection of several dozen Proud Boys, Patriot Prayer followers, and Cascade Legion fashy militia members converged on Westlake Park to “Stop Communism.” Seeing the futility of showing up to counter people here to counter our own holiday, they were largely left to their own devices, with only a few unaffiliated comrades and the odd liberal showing up to heckle them. In the end they did us a big favor, taking the attention of perhaps hundreds of cops and giving us one of the most delightful propaganda clips so far this year. Earlier that morning, dedicated antifascists made sure that fashy propaganda would not ruin the mood at the large El Comite march. The traditionally liberally minded, permitted May Day March for Immigrants and Workers Right, hit an all-time low in terms of attendance. A number of theories could explain why, from increased fear of turning out from the city’s immigrant community to disillusionment with self-policing parades on such a day, but the march did at least give some cheerful moments. A small black bloc of a few dozen had some fun outsmarting the cops and bringing them on wild goose chases, only to continually take their place back in the march without incident. There was also a large contingent Women of Color-led contingent which met the El Comite March near Union Station by the International District, adding a vibrant flair to the event. The evening festivities, traditionally the domain of the anti-capitalist march, proved to be an exciting cap on a successful May Day. They were kicked off by a second annual “Bloc the Juvie” block party opposing the under-construction Youth Jail. 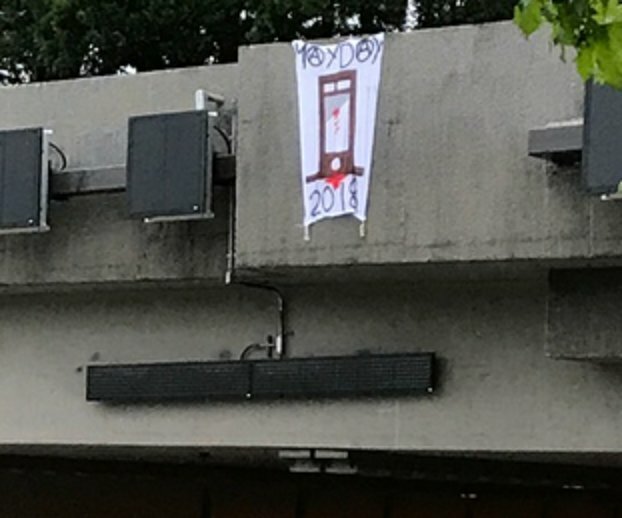 This year it was held in the U-District outside of a Howard S. Wright (the Juvie’s developer) job site. By all accounts it was a good time, with turnout reaching perhaps 100 at its peak despite the location being announced just an hour before. Those present were able to hold the street for the duration of the four-hour-long party, bringing in many passers-by in this heavy foot-traffic area. 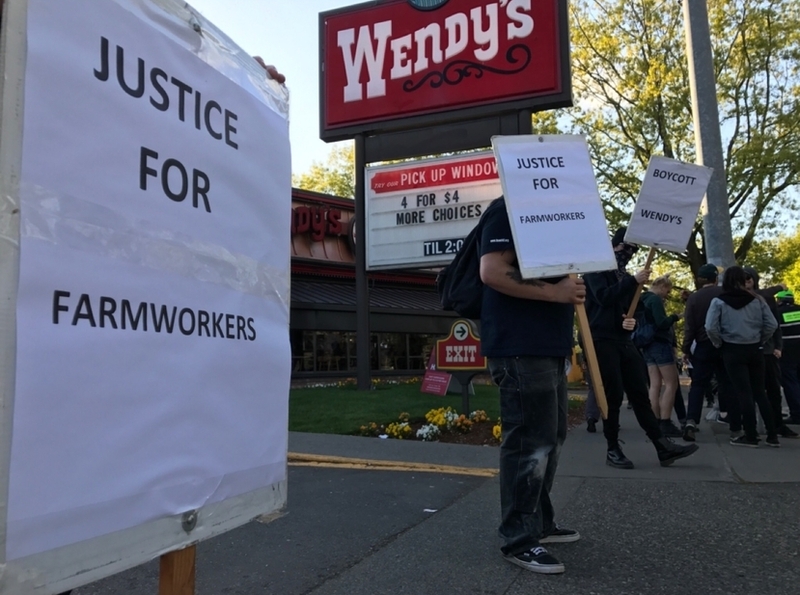 The Seattle IWW’s General Membership Branch and General Defense Committee held a little friendly competition to see who could better shut down a Wendy’s (link: https://pugetsoundanarchists.org/vehicle-plows-through-rowdy-wendys-may-day-picket-in-seattle/ ). The parallel actions started around 6:30, with the GMB up north in Lake City and the GDC down south on Rainier Ave. The action was in solidarity with the Coalition of Immokalee Workers boycott of the chain. Despite a car running through the GDC’s picket line, both actions were seen as a success.